The Arab uprisings that thundered on to the stage of history seem silent now; in some places, electorally outfoxed & everywhere subjected to brutal repression. With the election in Egypt of General Abdel el-Sisi, who led the military ouster of Mohamed Morsi (in 2013), it appears the entire uprising was for naught. But millions of people cannot participate in something so momentous & profound as the Arab uprisings & not be changed forever. Regimes do not use barbaric repression because they’ve brought the population to its knees. The Bahrain uprising which began February 2011 doesn’t get much news coverage; of course, neither does Egypt. There is something of a news blackout for both countries. The differences between the two countries are massive: first of all, Bahrain only has 1,250,000 people; Egypt has 86,503,000. They’re both autocracies but Egypt is run by the military & Bahrain by a feudal monarch. The key similarity between them is their importance to US economic & political interests in the Middle East which explains why the strategies deployed against both uprisings are very much the same: excessive violence bankrolled & backed with a high-tech arsenal from the US. After over three years of protest, the people of Bahrain know the odds against them more than anyone. Thousands have been killed, injured, incarcerated, tortured, & the regime has gained notoriety for the excessive, homicidal use of tear gas & birdshot. And still they rise! Despite a draconian decree last July banning protests, sit-ins, & all public gatherings indefinitely, a human rights monitor reported at least 837 protests in villages & town throughout the country just in April of this year with 195 of them attacked by riot cops. They also reported in that month that 170 protestors were arrested, including 29 children for rock throwing. There are checkpoints, people arrrested just walking down the street, & home raids in some cases by breaking down doors. And still they rise. One of the most inspiring things about the Bahrain uprising is of course the leading role of women–& women in veils. They have been in the streets leading protests for over three years & stand not only as a model for their children but as a beacon to suffering humanity everywhere by their intransigence & courage in the fight for freedom. The Bahrain regime brought in high paid thugs from the US & the UK to advise their security forces how to handle mostly unarmed protestors. 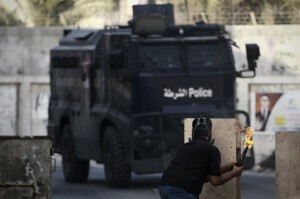 Here a young man thwarts a high-tech armored vehicle with a petrol bomb on May 30th in the village of Abu Saiba, just west of Manama. Our fullest solidarity with the democracy movement of Bahrain & our deepest respect for their courage.